The Mattel Intellivison, first released to the public in 1979 (and firstly broadly released in 1980) is a system that is near and dear to my heart, and was drastically ahead of its time. With its numeric keypad it offered sophisticated control options that we’d never seen on a game console before. 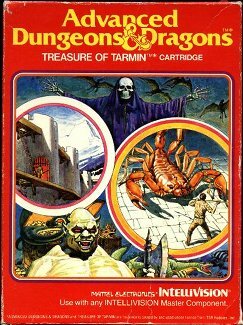 One of the games that showed off what was possible was “Advanced Dungeons & Dragons: Treasure Of Tarmin”, later re-released as “Minotaur” after the AD&D licence had lapsed. It was a first-person dungeon adventure with the ability to use magic, distance weapons, melee weapons, climb ladders, and so much more, and this for a game programmed in 1981 (though not released until 1983, presumably due to licencing issues). Also keep in mind that the Intellivision was a game system with only 1456 bytes of RAM! It’s also worth noting that box art was generally much better in those days. Need proof? Look no further than this game’s original box art. I remember being fascinated by that gigantic scorpion. Where do you see art like that these days? All of this brings me to “LCD Dungeon System”, a game that is trying to do two things simultaneously: harken back to the gameplay of Treasure of Tarmin, but reimagining/de-making it for an inexpensive old two-screen LCD handheld system. The game runs with this theme throughout. “LCD Dungeon System”‘s auto-map looks like a piece of graph paper that someone is drawing the dungeon on as they explore the game. The graphics offer the multi-level gameplay of Treasure of Tarmin with the simplistic presentation of early LCD handhelds flaws and all (such as visibly un-lit LCD areas, those who played early LCD handhelds know what I mean; the areas where nothing is being displayed, but that if you get it in the right light you can see it’s a place where something *could* be displayed). If you have absolutely no nostalgia for either of the game’s two influences then it’s possible that this may do nothing for you at all. If you’re familiar with either, though, you’ll likely get a kick out of this 80 Microsoft Point effort. And the gameplay, well ahead of its time in 1981, is simplistic by modern standards but still enjoyable.